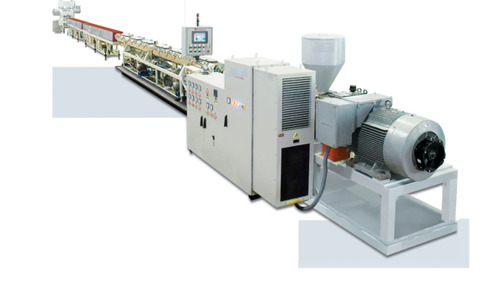 PPR Pipe Extruder Plant offered is backed by latest technology support and finds use in production of PPR pipes which are used in building hot and cold water systems including central heating systems, floor, wall and radiant heating systems. Other than this, the other uses of these pipes include for drinking water supply systems and in central (concentration) air - conditioning systems. The flawless functioning of these plants also provides in the pipes constructed features like internationally approved energy saving pipes, lightweight finish which makes them easy to transport and install, superior anti-heat performance with resistance against deformation between 200 C and +950 environmental temperatures, superior anti-corrosion resistance, low heat conduction factor and providing for firm pipe fittings connection among others. In the central (concentration) air - conditioning systems. PPR-C stands for poly Propylene Random Co Polymer.It is a water supply pipe used in construction.It is an internationally approved,high quality, environmentally friendly and energy saving pipe. It is lightweight : Density is 0.89-0.92g/CM3, only ie 1/9 of steel pipe,therefore easy to transport and install. Fine anti - heat performance : it is resistant to extreme heat/cold and will not deform or give in between -200 C and +950 environmental temperatures. Good anti-corrosion property : It is resistant to corrosion and does not rust,decay or erode. Low heat conduction factor : Heat conduction is 0.23-0.24W/mk at 200 C .It is much lower than that of galvanized steel pipe. It endures to heat and high climatic temperatures.It reserves its original form,flexibility and chemical properties at high temperatures. Firm pipe fittings connection : Because polypropylene has fine thermal casting performance.Thermal casting between the pipe and pipe fittings with the same material as an integration, it can prevent water from leaking. The friction correlation is very low,the surface is clean and smooth and will not hold other particles to fill in cavities.